Herb garden kits are an especially easy way to try your hand at indoor herb gardening, and some will even come equipped with artificial light to keep your plants happy and growing without the need for a sunny windowsill. If you prefer, go for the window herb garden kit that will provide the pots, dirt and seeds for your herb garden, while you supply the sunshine and water. There is nothing more inviting in a kitchen than a windowsill lined with fragrant herbs. Herb garden kits come in a wide variety of shapes and sizes, and some do not even require that you place the seeds into the dirt. There are kits that include seed filled mats that you simply lay on top of the soil and water. Others come with pre-planted seed pods that you add water to and watch them grow. Other herb garden kits will supply the pots, soil and seeds so that you can get in on the planting action yourself. Some kits are fairly basic in appearance, making them a good choice for the outdoor garden. Others come with decorative pots and planters that make them an attractive choice for indoor gardening or outdoor patios. The fun thing about the herb garden kits is that you can choose from a broad spectrum of themes that offer a variety of plants. For example, you can choose from Italian kits that will come equipped with all of the favorite Italian seasonings like oregano, basil and parsley. Or go for a butterfly herb garden kit that will help you to attract these gorgeous insects to your yard with just the right mix of colors and fragrances. Choose a medicinal herb garden with selections of plants designed to heal and protect the body. These themed kits can be a fun way to delve into the herb gardening experience. 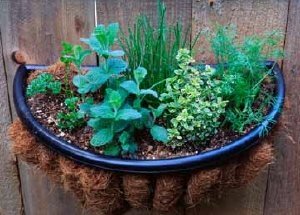 Herbs can be a fun and easy crop to grow, even if you don't consider yourself to have a green thumb. Herb garden kits can make the entire process even easier. Happy gardening!